Now I don't usually post events that aren't free, but considering this is for charity, I think I'll make an exception. If you haven't purchased your tickets yet, it's going to cost you $125, but the pros far out way the cons. 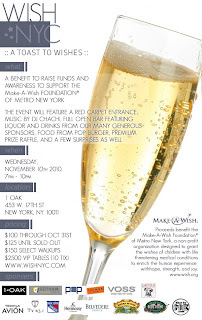 The event is being thrown at 1Oak, one of the trendiest exclusive clubs in the city, there is a three hour open bar included with your ticket, there's a killer raffle with some amazing prices, and did I mention this is for charity?! The soiree will benefit the Make-A-Wish Foundation, and don't you want to do something good for a change? I know you probably drop this much during a typical night on the town! What are you waiting for?! Buy your tickets here and I'll see you there!